Golf will be played as singles, regular doubles and mixed doubles. Men's and women’s two man shamble and mixed two man shamble will be played at the same time. 4. Athletes may compete with only one partner per event. Team and mixed team are classified as events. Therefore, athletes may not compete in more than one age division for team or mixed team. 5. The age category of competition for team and mixed team will be determined by the younger age of the two partners the day of Opening Ceremony – July 17, 2020. 1. Golfers will play their own ball. Both gross and net score, hole by hole on the official scorecard will be tracked. 2. Handicaps have to be provided based off the U.S.G.A. handicapping system. 3. If no handicap is provided, you will only qualify for a medal in the gross scoring category. 4. For team play, players will get half their handicap for net scoring purposes. 5. The team score will be the best/lowest ball score of the two players. 6. Each team will keep a gross score and a net score on the official scorecard. 7. Both players must have a handicap to qualify for the net scoring category. 1. Singles- Medals will be awarded to first, second, and third to Division 1 and Division 2 athletes by age group and gender. In addition to net and gross scoring categories. 1. 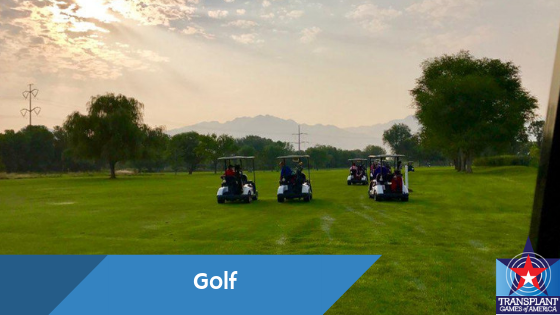 Golfing staff will be responsible for queuing competitors and directing them to the tee box. 2. 14 club rule is in effect (14 clubs in your bag). 3. Out of bounds is marked by white hazards. Yellow lines/stakes mark water hazards and white lines/stakes define ground under repair. French drains are GUR. 4. Each course will define ground under repair prior to competition. 5. Golf cart use during official competition rounds are mandatory for competitors. 6. Range finders are allowed. 1. Both players will tee off from the appropriate tee (as described in singles golf). 2. The team will choose the best drive. Each player will then play their own ball through the hole from that point. 3. The players will get half their handicap for net scoring purposes. 4. The team score will be the best/lowest ball score of the two players. 5. Each team will keep a gross score and a net score on the official scorecard. 6. Both players must have a handicap to qualify for the net scoring category. U.S.G.A. rules apply except where modified by local rules (www.usga.org). With some modifications. Once an event is completed and results are available, golf staff must record all competitors and times/scores to the appropriate system/documents. When electronic scoring is being utilized a manual backup system must be in place to record results.